I think the BOJ’s negative interest policy will last for several years. Technically speaking, it takes years to make result by implementing any monetary policies in the market. In fact, BOJ’s 2% inflation objective was already push back to after 2017. In Europe, where the negative interest rate policy was adopted by ECB and other some central banks a couple years ago, their economies are still struggling with low-inflation with the low growth. So, what will happen to investments? And, what should we do? Let’s take a look at the table attached. 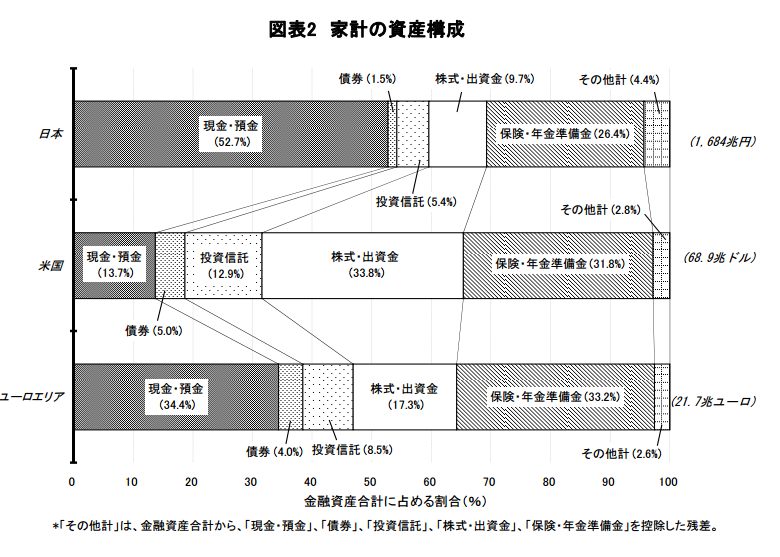 Like before, allocations to financial asset by the Japanese households are not changed. Deposits are 53%, which account manly for the asset. Insurances and Pensions are 26%, then Stocks are 10%, followed by Investment trusts 5% and Bonds 2%. This suggest that the share of the deposits will not reduce since banks still pay interest on deposits and that their mindset will not be changed so soon. Having said so, there seems a big impact on Insurances and Pensions. This sector invests in stocks and bonds. As the yields in bonds up to 10 years are almost all negative, it is difficult to make money from bonds even if they invest in ultra-long term bond. It is also unrealistic to shift their portfolio from bonds to stocks drastically as it is too risky. This means that the portfolio yields will deteriorate and may lose the pension reserve in portfolio. And, then, they will cut the pension benefits or raise the pension age further. Currently, elderly people can get paid their pension from 65 years old. We will lose 5 year pension benefits if it is push back to 70 years old. Well, the negative interest, which is “persona non-grata”, may do something for macro economy but does not make sense to us. Now, let’s take a look at the real economy. I believe that the negative interest policy will not neither grow economy nor increase capital expenditure. This is because (1) only a few consumer enjoy benefits from stock market rally and the consumption tax will increase to 10% soon. (2) since the bubble burst in late 80s, no correlations have existed between the level of interest rate and capex demands. In addition, big companies have an abundant money with the lowest ULC in the long standing deflationary environment. There is no compelling reason for them to borrow money for nothing. However, you have to do something for your asset. I recommend you refer to the successful portfolio like the endowments in the US, which performs steadily even in the tough market environment just after Lehman collapse in 2008. Furthermore, I would like you to start a regular savings plan with deposits or investment trust, which does not force you to invest a big lump sum. To build assets in the long run, the earlier the better and younger the better. There is no royal road to make money.